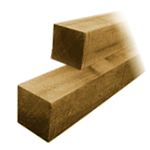 Fence Rite are a leading West Midlands supplier of wooden fence posts. Every searched for ‘fencing supplies near me?’ Then look no further than us! Out timber fence posts come in a variety of sizes and lengths. They go perfect with Fence Rite’s lap and featheredge fence panels, all at a very competitive price. Our wooden fence posts are made from high quality timber and pressure treated to elongate lifespan. Fence Rite are based in Cradley Heath although we will deliver your fence panels and wooden fence post supplies to you which will include a delivery fee.